In this first installment of the prequel trilogy for the New York Times bestselling series Malazan Book of Fallen, an ancient power emerges at the brink of civil warSteven Erikson entered the pantheon of great fantasy writers with his debut, Gardens of the Moon. 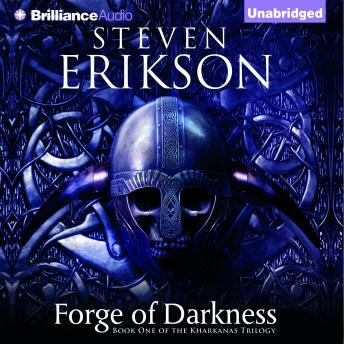 Now Erikson returns with a trilogy that takes place millennia before the events of the Malazan Book of the Fallen. Forge of Darkness introduces listeners to Kurald Galain, the warren of Darkness, and tells an epic tale of a realm whose fate plays a crucial role in shaping the world of the Malazan Empire.It’s a conflicted time in Kurald Galain, the realm of Darkness, where Mother Dark reigns. This ancient land was once home to many powers…and even death is not quite eternal. The commoners’ great hero, Vatha Urusander, is being promoted by his followers to take Mother Dark’s hand in marriage, but her Consort, Lord Draconus, stands in the way of such ambitions. The impending clash sends fissures throughout the realm, and as rumors of civil war burn through the masses, an ancient power emerges from the long dead seas. Caught in the middle of it all are the First Sons of Darkness, Anomander, Andarist, and Silchas Ruin of the Purake Hold.Steven Erikson brings to life this ancient and important tale set in the world he introduced in the Malazan Book of the Fallen.